Profit at Pacific island casino operator Imperial Pacific International Holdings Ltd plummeted 91.3 percent year-on-year in the first half of 2018, it said in a Thursday filing to the Hong Kong Stock Exchange. Such profit was approximately HKD78.98 million (US$10.1 million) compared to HKD912.03 million in the prior-year reporting period. Adjusted earnings before interest, taxation, depreciation and amortisation dipped 72.2 percent to HKD450.48 million, from HKD1.62 billion in the prior-year period. Imperial Pacific reported group-wide revenue of HKD2.21 billion for the six months to June 30, down 51 percent from a year earlier. 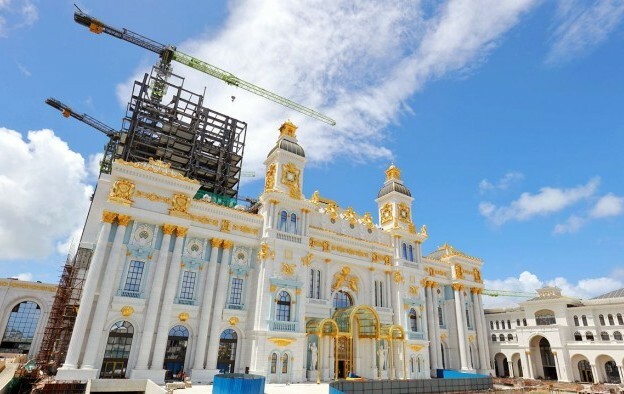 The Hong Kong-listed company operates the still-under-construction property Imperial Pacific Resort (pictured in a file photo) on Saipan, in the Commonwealth of the Northern Mariana Islands (CNMI), a United States jurisdiction. VIP table games rolling – accounting for most of Imperial Pacific’s casino business – nearly halved year-on-year in the first six months of 2018. Such rolling amounted to HKD100.28 billion, compared to HKD196.28 billion in the prior year period. VIP gross gaming revenue for the latest reporting period was HKD3.42 billion, compared to HKD7.09 billion for the first half of 2017. Gross trade receivables – typically associated in the casino industry with money owed by VIP gamblers for losses they incurred while playing on credit – for the six months to June 30 were up slightly, at HKD13.70 billion, compared to HKD13.28 billion in the prior-year period. The provision for impairment of trade receivables due from the group’s 10 largest debtors amounted to HKD2.46 billion in the first half, said Imperial Pacific. The firm was reportedly awaiting a decision due on Friday about whether the terms of its Saipan casino licence would be amended by the authorities there and the deadline for completion of its so-called “initial” facility possibly extended to 2020. The Marianas Variety newspaper reported on Friday that a Thursday meeting of the CNMI Lottery Commission heard that the company was already in breach of its casino licence agreement because it would not be able to meet its current August 31 deadline to complete the initial phase of its casino hotel project at Garapan. The company has asked for a formal extension on that deadline, according to its previous filings. The document did not refer explicitly to the alleged violations of local labour law by sub-contractors that had worked on the project. But the document did add that the labour situation had been “ameliorated tremendously” during the reporting period, with the firm having secured “adequate labour supply from Guam, the Philippines and Taiwan” to cater for its construction needs. The filing added that – as of the date of the document – “approximately US$708 million” had been invested in “design, consulting, engineering, construction material and labour”. Previous filings had mentioned US$650 million being invested in those things. “The management is in discussion with other potential investors to secure long-term financing for the remaining construction of the integrated gaming resort,” stated Thursday’s interim results.